The most unique and best information I have found yet on the Maya is from a web site called "Authentic Maya". Much of the information in this section can also be found on that site if you want to learn more. I have just been given this information so I will add more as I study it and learn more, but the local history of the Rio Dulce/Izabal region has been documented at least from about 2500 years ago. The original inhabitants were Ch'orti' whose main city was Copan in Honduras, and those that didn't die of influenza, smallpox, etc. were subsequently turned into slaves/peons for spanish landowners and shipped all over Guatemala. A fairly large community of them is now in Gualan as well as in the area between Chiquimula and Copan which is so heavily deforested. For more information until I summarize it to accommodate the local area, you can read a Google book at this link. Another highly informative book is located here. A third book just came to my attention on Maya History and Religion that you can read here. You should REALLY take the time to read some of this stuff, you may understand much more and be a bit surprised to hear what has REALLY happened here in the past and why things are done the way they are, "Gringo's" are looked at and treated the way they are. Maya Civilization, is an ancient Native American culture that represented one of the most advanced civilizations in the western hemisphere before the arrival of Europeans. 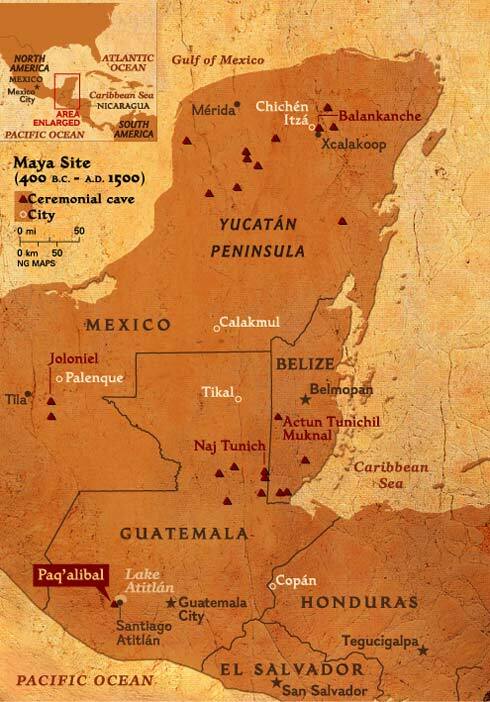 The people known as the Maya lived in the region that is now eastern and southern Mexico, Guatemala, Belize, El Salvador, and western Honduras. The Maya culture reached its highest development from about AD 300 to 900. The Maya built massive stone pyramids, temples, and sculpture and accomplished complex achievements in mathematics and astronomy, which were recorded in hieroglyphs (a pictorial form of writing). The timeline below will perhaps give you a better understanding of their development as history is documented at this point. 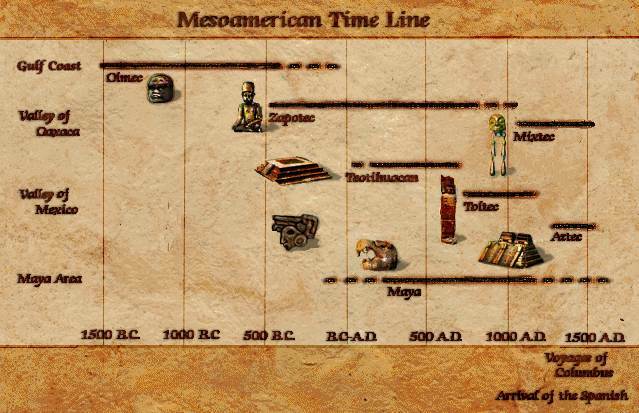 The time line above links to a table about some of the various Mayan archeological sites. The Maya nation is an homogeneous group of people who have occupied roughly the same territory for thousands of years. They speak some thirty languages that are so similar that linguists believe that they all have the same origin, a proto Mayan language that could be as much as 7000 years old! They will explain how geographical isolation made the original language evolve towards an eastern branch subdivided into proto-K'iche and Mam and a western branch subdivided into proto-Q'anjob and proto-Tzeltal and how the further division of these sub branches gave rise to the 30 languages spoken today. The in situ evolution of their language implies that they were the original permanent inhabitants of the Maya area and suggests that today's two million Mayas probably share a very ancient common genetic origin. There are hundreds of known Maya sites spanning two millennia. It can get quite confusing so to better clarify the cities of the Maya and their time frames, there is a table on this link for a quick reference of where some of the more important sites are located (southern highlands, central lowlands and northern lowlands) and the period they are best associated with (pre-classic, classic and post classic). The highlighted sites are linked to one of the pages of this website. The others provide a minimum of information on each site. That is quite different from the warlike Aztec and Inca nations who invaded their neighbors and absorbed their populations by imposing their language, customs and religion. 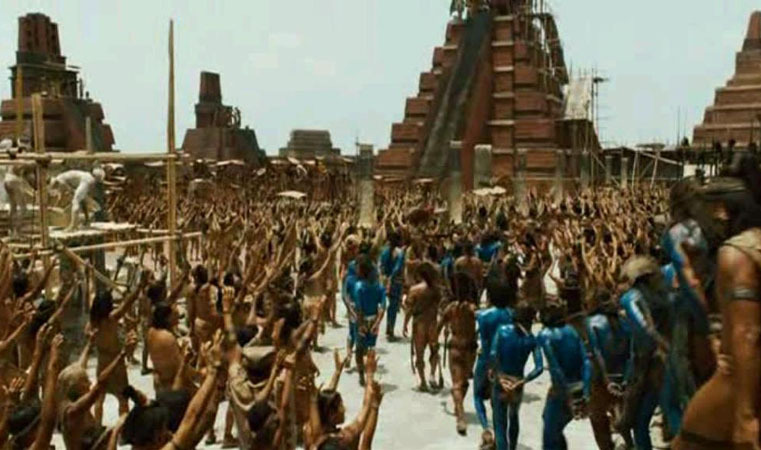 The Aztecs were a small ambitious "Chichimec" (savage) tribe from the north west who migrated into new lands, absorbed new ideas, evolved further and grew powerful enough to impose their language and gods (Huitzilopochtli), on the indigenous people they conquered. It is the story of outsiders becoming the governing elite of pre-existing populations for a relatively short time. The Incas of Cuzco were also a short lived foreign elite governing a wide variety of pre-existing nations. The Maya had no centralized political leadership. They developed a common culture by absorbing and developing elements borrowed from their neighbors. The long count calendar, writing with glyphs and the basic tenets of their religion can be traced directly to the Olmecs through Izapa. The Olmec civilization disappeared before the advent of the Christ but its heritage formed the basis for all other mezoamerican civilizations such as the Monte Alban Zapotec, the great Teotihuacan hegemony, the Tula Toltecs and finally the Aztecs. The Maya were also influenced by Teotihuacan that controlled the Mexican highlands from the first to the seventh centuries. 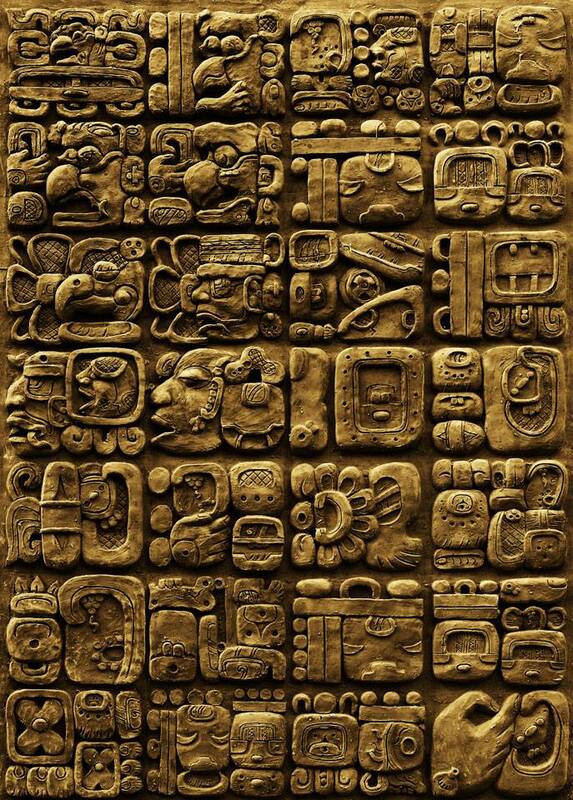 The Mayan golden age lasted five centuries from 300 to 800 AD. Then, they stopped building temples, declined and became fragmented in competing states that were easy prey for invading forces from the north such as the Toltec which had been expelled from Tula around the end of the 10th century. The Toltecs became the ruling elite of the Maya in the post classic period. Toltec gods were added to the Maya pantheon but the Toltecs were absorbed as they leaned to speak Yucatec Maya. The Maya were organized in city states, sometimes co-operating, sometimes fighting each other but they shared the same beliefs and deferred to priests who derived power from their knowledge of astronomy, mathematics and numerology. The Maya were very much aware of the passage of time. They recorded some dates on stelae and probably much more in books that are lost now because fanatical Spanish Catholic priests destroyed them to eradicate "pagan beliefs". Retracing the history of the Maya is like finding the solution of a detective novel for we have to rely on whatever clues we can find in what is left of archaeological sites that the Spanish did not plunder or destroy. There are many unanswered questions about the Maya but the cause of their decline remains the greatest mystery. Their civilization was not destroyed by an overwhelming outside force. The Olmec suffered the destruction of San Lorenzo around 900 BC and that of La Venta around 600 BC but no such catastrophe befell the Maya. Similarly, Teotihuacan was destroyed by warfare around 700 and so was Tula around 1000 AD but Maya power disintegrated from within. Many hypotheses have been proposed, overpopulation, famine, epidemics, civil disorder... Some of these factors might have played a role in some places but I tend to think that the common people just stopped believing in the dogma the elites were using to establish their power and justify their excesses. Similarly, the disintegration of the Soviet Empire can largely be explained by the excesses of a corrupt elite and the subsequent disbelief in the supremacy of the communist system by the common people. The most ancient hieroglyphs date from the end of the 4th millennium BC and comprise annotations to the scenes cut in relief- -found on slabs of slate in chapels or tombs- -that had been donated as votive offerings. Although by no means all of these earliest signs can be read today, it is nonetheless probable that these forms are based on the same system as the later classical hieroglyphs. In individual cases, it can be said with certainty that it is not the copied object that is designated but rather another word phonetically similar to it. This circumstance means that hieroglyphs were from the very beginning phonetic symbols. An earlier stage consisting exclusively of picture writing using actual illustrations of the intended words cannot be shown to have existed in Egypt; indeed, such a stage can with great probability be ruled out. No development from pictures to letters took place; hieroglyphic writing was never solely a system of picture writing. It can also be said with certainty that the jar marks (signs on the bottom of clay vessels) that occur at roughly the same period do not represent a primitive form of the script. Rather, these designs developed in parallel fashion to hieroglyphic writing and were influenced by it. It is not possible to prove the connection of hieroglyphs to the slightly older cuneiform characters used by the Sumerians in southern Mesopotamia. Such a relationship is improbable because the two scripts are based on entirely different systems. What is conceivable is a general tendency toward words being fixed by the use of signs, without transmission of particular systems. The Maya developed a sophisticated calendar. The ritual calendar that developed in Mesoamerica used a count of 260 days. This calendar gave each day a name, much like our days of the week. There were 20 day names, each represented by a unique symbol. The days were numbered from 1 to 13. Since there are 20 day names, after the count of thirteen was reached, the next day was numbered 1 again. The 260-day or sacred count calendar was in use throughout Mesoamerica for centuries, probably before the beginning of writing. The Maya also tracked a vague solar year in which they counted 365 days per year. Because they could not use fractions, the "quarter" day left over every year caused their calendar to drift with regard to the actual solar year. The 365-day year contained months were also given names. numbers 0-19 before they changed, so that the count goes Zero Pohp to 19 Pohp, then continues with Zero Wo. To the eighteen regular months the Maya appended a special five-day month called Wayeb composed of 5 days which were considered unnamed and unlucky. Thus the days were counted: One Imix, Zero Pohp, Two Ik, One Pohp. When the thirteenth day was reached the next day was Thirteen Ben, Twelve Pohp; then One Ix, Thirteen Pohp, Two Men, Fourteen Pohp. After Seven Ahaw, Nineteen Pohp, the next day was Eight Imix, Zero Wo. Merchants were important to Maya society because of the significance of trade. Principal interior trade routes connected all the great Classic lowland centers and controlled the flow of goods such as salt, obsidian, jade, cacao, animal pelts, tropical bird feathers, and luxury ceramics. In the early Classic period Teotihuac�n in central Mexico emerged as the greatest city in Mesoamerica, an area that included modern Mexico and most of Central America. The religious and political power of Teotihuac�n radiated throughout Mesoamerica. One result of Teotihuac�n�s influence was a highly integrated network of trade in which the Maya participated. Highland Maya from the southern region carried obsidian for tools and weapons; grinding stones; jade; green parrot and quetzal feathers; a tree resin called copal to burn as incense; and cochineal, a red dye made from dried insects. Those from the lowlands brought jaguar pelts, chert (flint), salt, cotton fibers and cloth, balche, wax, honey, dried fish, and smoked venison. People either bartered goods directly or exchanged them for cacao beans, which were used as a kind of currency. Wealth acquired from trade enabled the upper classes to live in luxury, although there was little improvement in the lives of the lower classes.